Pilates for weight loss? Can Pilates actually help with losing weight? All of the recent hype about Pilates exercises have caused some questions as to whether it is cardiovascular in nature and can you burn enough calories to actually lose weight by doing it? 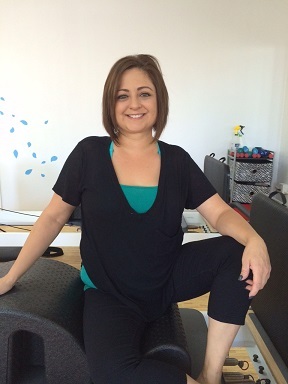 Lysa is a great example of how Pilates exercises can help you lose weight and tone up. She has lost 3 inches around her waist, 2 inches from things, and lost 30 pounds doing Pilates for weight loss. Generally, during exercise your heart rate needs to be elevated for an extended period of time to reap cardiovascular benefits and burn calories, hopefully losing weight in the process. Pilates exercises are mostly anaerobic in nature, meaning without oxygen, so your heart rate is only elevated for a period of less than 30 seconds. This 30-second type interval training goes on consecutively throughout your routine, which can last up to an hour. This interval based workout conditions the deeper seeded muscles to work more efficiently, and, in turn they gain more muscle endurance. More endurance means the muscles can work longer and not tire, performing more advanced movements as you progress. Is this effective then, in Pilates for weight loss you wonder? My experience, and my clients from doing Pilates on a consistent basis is that it does stimulate muscle growth, which, in turn can stimulate Pilates for weight loss. Any time you build lean muscle tissue in the body it stimulates your metabolism, which in turn causes fat loss in the body. Or, better yet causes an increase in lean muscle tissue compared to fat! The lean-to-fat tissue ratio in the body is most important for our health and well-being. This ratio is one of the risk factors for cardiovascular disease; including obesity and diabetes. Pilates done consistently over time can influence weight loss by building muscle tissue. But probably the most noticeable effects you will see in your body are the firming and loss of inches around the waist, thighs, and arms. Hundreds – Improves respiratory muscle functioning and flattens the stomach. · Roll-up (Shown Here) – Strengthens the abdominal muscles while stretching the spinal muscles and opening the vertebrae, making you look and feel taller. · Single Leg Stretch – Stretches the muscles in the legs and back while working the abdominals. · Double Leg Stretch – Stretches the muscles in the legs and back while working the abs. · Criss Cross – One of the most effective to stretch and strengthen the muscles at the waist and through your sides. · Corkscrew – Very effective at strengthening the pelvic floor muscles and the waist with the twisting motion. · Spine Twist – Stretches the muscles of the back and sides while working the waist. · Leg Circles – Differentiation at the hip while working to stretch and strengthen the upper thigh with a stable torso. · Side Kicks: Up/down, Front/Back, Circles, Heel Clicks – These are all intended for the thigh, with toes turned up or out is more effective. · Leg Springs on the Cadillac – Stretching and strengthening the thighs with spring tension as added instability. · Thigh Stretch on reformer – Can take inches off your thighs with the intense stretching and pulling action. · Bridges – Bracing yourself while up in the bridge really works the triceps. · Hug a tree on reformer – This exercise focuses on working the upper back while stretching the chest, but is great at trimming the arms with the extension involved. -Salute on reformer – Great exercise for the triceps. · Rowing front and back on reformer – Works the upper back and arms like a lateral rowing exercise. · Long back stretch on reformer – This one really works the triceps while supporting your own body weight in a dynamic movement. · Leg-pull front and back support on floor or reformer – These two work all aspects of the arms and stabilizing muscles of the shoulder joint. · Ribcage arm series with circles on floor or with straps on reformer – Very effective stretches to strengthen the arms especially with some tension to pull the muscles into a longer and leaner look. 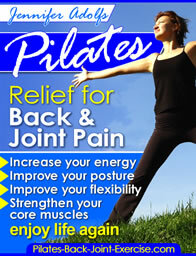 Leave Pilates for Weight Loss and get your Healthy Joints Pilates DVD today. Check out this series of 3 weight loss dvd's to jump start your metabolism and see results in as little as 30 minutes. The first dvd is a 30 minute power workout that will help kick start your metabolism to burn more calories. The second Pilates dvd is a 60 minute conditioning for weight loss. This one allows you to progress at your own pace whether you are a beginner or intermediate level with the 2 variation's on the workout. The third in the series is a 45 minute high intensity that will burn more calories and help you to continue to lose or maintain where you are.